Each year, Zencos looks forward to SAS Global Forum. This conference is where SAS users flock to see what SAS Institute has been cooking up, to learn the latest SAS application tips and tricks, and to network with other data and analytics industry professionals. The conference is in Dallas, Texas, this April 2019. Just as everything is bigger in the Lone Star State, conference attendance is no exception. Over 5,000 data professionals from banking, insurance, healthcare, and education fields attend the annual conference. “Zencos is excited about our 18 years of being a SAS Partner and SAS Global Forum Emerald sponsor. Our clients and all SAS users get a lot of value out of this conference. We are looking forward to seeing everyone,” commented David Septoff, Zencos CEO. Stop by our Booth for Nerds! 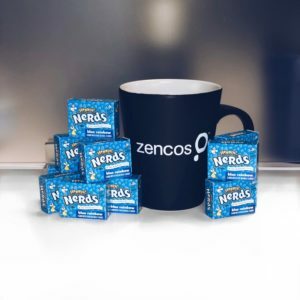 Stop by the Zencos booth to grab a box of nerds. While you are there, talk to our experienced consultants about your latest project challenges and how we can help you unlock more value from your most important asset – your data. If you are suffering from SAS system performance issues, let’s discuss the best ways to resolve those. If your grid architecture is overloaded, we can discuss various options available to relieve the traffic. If you are considering refining some of your analytical models, our data scientists would be happy to lend an ear to brainstorm with you. During our sessions this year, we will address the latest challenges our clients face while working to extract value from their data. We have learned valuable lessons from our work that we want to share with you. SAS users find productive value in the many applications available such as SAS®Visual Analytics, SAS® Visual Text Analytics, and SAS® Viya® Visual Data Mining and Machine Learning (VDMML). We want to show you how to unlock even more value from these solutions. Analysts tend to be numbers people who make the mistake of showing only the statistical results and machine learning model outcomes. They don’t provide context or actionable insights with the numbers. Since your business leaders do not speak this language, they get frustrated and don’t think the analytics programs are worth the time and investment. By mixing data visualization, motivating narratives, and compelling data, you can maximize your impact and get on the same page with the key stakeholders in your organization. You will learn why audiences love stories and the steps for creating a dazzling data story. You will write persuasive messages and then collaborate with a small team to create data stories around those messages. This workshop is an abbreviated version of our full-day course that you can bring to your site. Whether you like it or not, your customers are posting things about you online. You may not be listening to what your customers are saying, but it’s not because you aren’t interested in your customers. You wouldn’t be in business without them. It is because you may not be able to make sense from the volume of the information coming from your online data. Fortunately, SAS Visual Text Analytics can help you quickly sift through your data to find the actionable insights. You can see SAS Viya in action using data from the most recent men’s national basketball championship. Chris St. Jeor uses data from the men’s basketball championship to predict the results of the brackets and the ultimate winner. This demonstration walks you through a host of easy-to-use predictive modeling solutions available in SAS Viya VDMML. Learn the pros and cons of each model and how to choose the best solution for the job. “After having my bracket busted every year, I decided to use SAS Viya VDMML to save me from the stress and anguish and just let the machine learning tell me what to do,” said St. Jeor. Don’t miss this live, in-action session that will show you how easy a real world analytic modeling problem, such as picking NCAA® brackets, can be addressed with SAS Viya VDMML. How can an artist who lived over 500 years ago be significant to data communications today? Leonardo da Vinci, most famous for his iconic Mona Lisa painting, had a tremendous influence on the art world, but he also inspired medicine, architecture, and even the military. You can apply his love of details, curiosity about the world, and inspired beauty to your data presentations for a true masterpiece. What is Preventing Your Analytics Strategy Success? Research on 74 global companies uncovered a positive association between analytics maturity and financial performance. Those in the fourth stage of the analytics maturity model ranked higher in “Top Company” lists than their counterparts in levels two and three. In a recent study, Gartner said they would classify 87% of companies in the lower stages of maturity. If there is a stronger correlation between performance and analytics, why aren’t more companies focused on transformation? What is causing the inability to be successful in an internal program? In this session, we address the factors that prevent organizations from being successful with their analytics strategies. It is a multi-faceted issue that crosses employee data literacy and skills engagement, ability to use data successfully, and an overall lack of strategy. You will learn the common obstacles that deter companies from making meaningful progress. You will also learn the strategies for success used by other companies. The primary issue with typical Anti-Money Laundering (AML) cycles is the amount of time wasted from investigating low priority alerts generated through the classic scenario-based monitoring techniques that lead to a plethora of false positives. Industry analysts estimate that as much as 95% of AML alerts turn out to be false-positives. Using the power of SAS Viya, specifically VDMML, financial institutions can find new levels of efficiency in the AML/BSA cycle.